Winners of the Heather Thurmeier and Contemporaries to Covet giveaways! First of all, I’m so sorry I didn’t post the winners of the Contemporaries to Covet in October giveaway last week. We went to England for my grandfather-in-law’s funeral last week (miss you, Granddad) and I was a bit frazzled with all I had to do before going away. Without further delay, the winner of a $10 gift certificate to the online book retailer of their choice is…Rosemary K! Congrats, Rosemary! Email me at romancingkatrina[at]gmail[dot]com and let me know where you’d like me to buy your g.c. …which means that Rosemary has won a $10 gift certificate for Jennifer Probst, too! I’ll email Jennifer directly. Last week, I had the lovely Heather Thurmeier here talking about reality TV and romance. 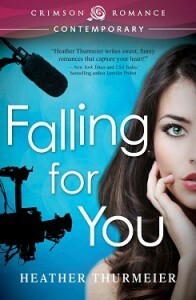 She’s giving away a digital copy of her latest contemporary romance, Falling for You. The lucky winner is…Sue P! Sue, email me at romancingkatrina[at]gmail[dot]com and let me know which digital format you’d like your book in (Kindle, Nook, etc). Everyone, this week you can win the debut paranormal romance of one of my favorite authors, Moriah Densley. I’m so excited! Thank you Rosemary for mentioning The Marriage Trap – I hope you enjoy it!And thanks to Kat for the wonderful contest that connects authors with readers -we appreciate you so much!! Jennifer Probst recently posted..Release Day for The Marriage Trap!